Did you know an orange is a berry? Do you know the name of Isaac Newton's dog? Of course not! It's Diamond. This weekend my bro from New Hampshire and his wife visited. They booked their flight to coincide with Boy15's acting debut. Turns out the school has changed the dates twice and so Chris and Donna didn't get to see the play afterall. Well, it's only about a 20 minute one act play, so maybe if this turns out well, he will continue and act again. It seems to run in the family, though not in me. 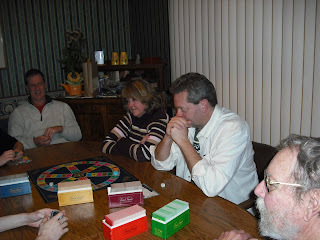 Here we are playing one of many games this weekend Trivial Pursuit. Also, played Golf (a card game), BS (cards), pitch (one dummy hand, too complicated at 11 pm), Apples to Apples. Boy14 is a big gamer, loves to play games which my family does also. We ate too much food this weekend, pork roast, pastabilities, corned beef and cabbage. Apple dumplings, Tres Leche cake, fruit salad, and on and on. And what is in Nephew9's mouth? A candy cane I guess. His eyes almost always come out red, too. 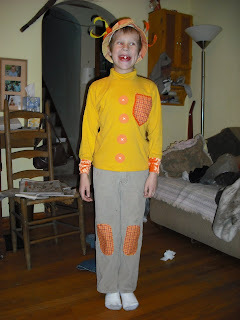 Sorry, not a good picture, but you can see the costume. I wasn't being purposely cryptic, I was being scatter brained. I intended to pick up on Madz' meme and post the fourth picture in my fourth picture file. When I looked in "My Pictures" I was okay with the picture. One of my sister, boys and nephew at the Hard Rock Cafe a couple years ago. 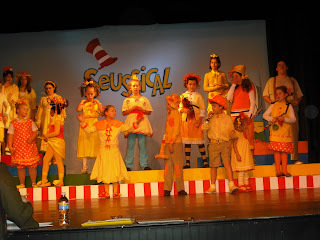 Well, when I went to browse and add a picture here, there were only 3 pictures in the fourth file (Boy15's rock band previously posted) so I posted this whimsical photo of the musical "SUESSICAL" dress rehearsal I watched the weekend of New Year's at my sister's house. Nephew9 is the one turned around in this photo. I actually helped decorate the costume. Aren't the little girls precious? My parents went down for the performance last weekend and said it was just great. Anyway, I uploaded the picture and was too tired to write anything, and this might it be it for a while. Betsy mentioned seeing it, and Ginnie commented so I thought I better do some explaining! Classes start on Wednesday and that is a 17 hour day for me each week (commute plus three classes)and working 32 hours on the other days. Then doing homework on the weekends. Sounds like fun:) If you know me, you know I'll probably love it. Invigorating! Exhilerating! Exhausting? While visiting Betsy, we went out for a evening on the town and went to a lesbian play called "Pulp". It was funny and clever, post World War II when lesbians were very much in the underground. This play took place in a lesbian club in Chicago and featured 6 diverse women. The previous picture was a Danish ornament I bought last March in you guessed it, Denmark, actually at the gift shop of Kronberg Castle. I call it the pretzel girl, natch.